Update the decor of any room in 10 minutes! There are lots of ways to update the decor of a room - fresh paint, new furniture, better lighting. 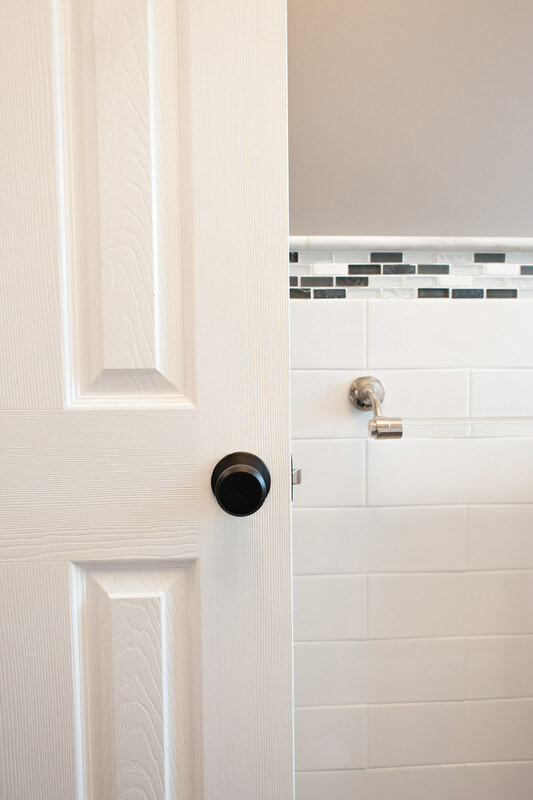 But there are few better or faster ways to make a quick change in almost no time at all than to update the door hardware. It's a small and easy change but the impact is big. If you know me, I'm a hardware junkie. I fell in love with the limestone partially because of the door hardware. Even though the rest of the house was a complete disaster, the hardware was the window into the past that lured me in and inspired me to take on the challenge. I love to visit architectural salvage shops and pour through their vintage hardware for great finds. There is something oddly sentimental about a good doorknob to me. I imagine all the hands it touched over the years - like a small bit of history saved. Even when used in less than traditional ways, I'm a sucker for a good doorknob. Practically speaking, the right door hardware has outsized visual impact. 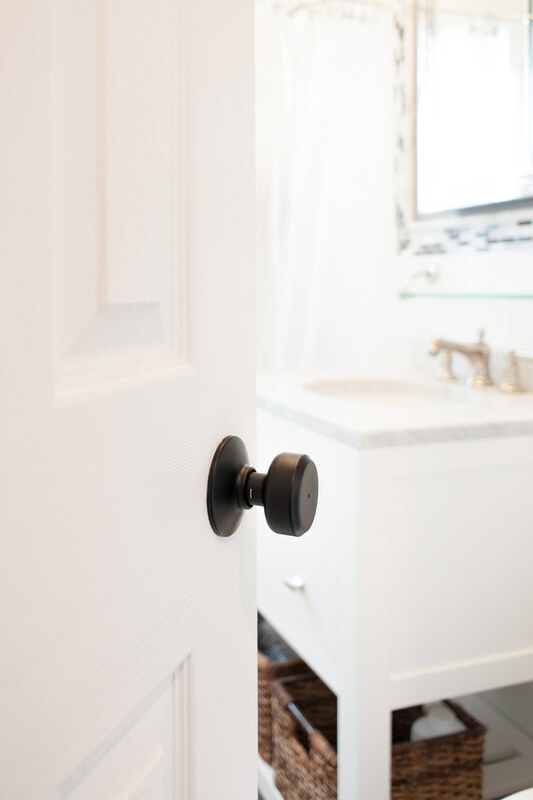 Think of a great doorknob as the great pair of earrings to pair with a classic dress. Small in size but can instantly update a space. Best of all? 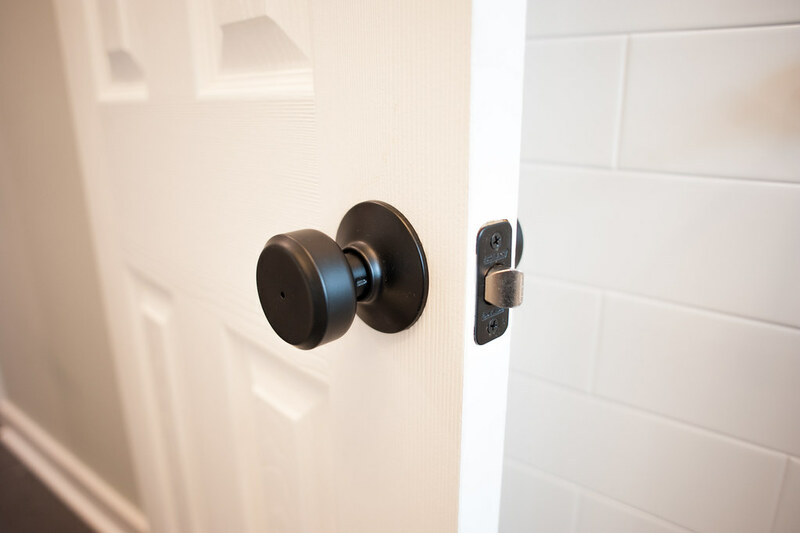 Replacing an old doorknob with a new one could not be easier! It requires no special tools or skills - simply unscrew the one you have, pop in the new one and screw together. Voila! I had been wanting to change out the door hardware in our shore apartment for ages but it never made it high enough on the to-do list. A few years back we renovated the BATHROOM but left the door hardware for a future project. Then hurricane Sandy hit and we renovated the KITCHEN, but again, we never got around to tackling that door hardware. There has always been a mishmash of colors and styles that drove me a little crazy. It's a small thing but the wrong door hardware always screams "thrown together" to me in a way that is never a good thing. So when Schlage contacted me to see if I was interested in partnering with them, I jumped at the chance. Having used Schlage locks for years already, I knew I was getting a quality product that would last and would feel sturdy to the touch. Since I like to mix metals as my tastes change, I wanted the knobs to be versatile to work with any finish. 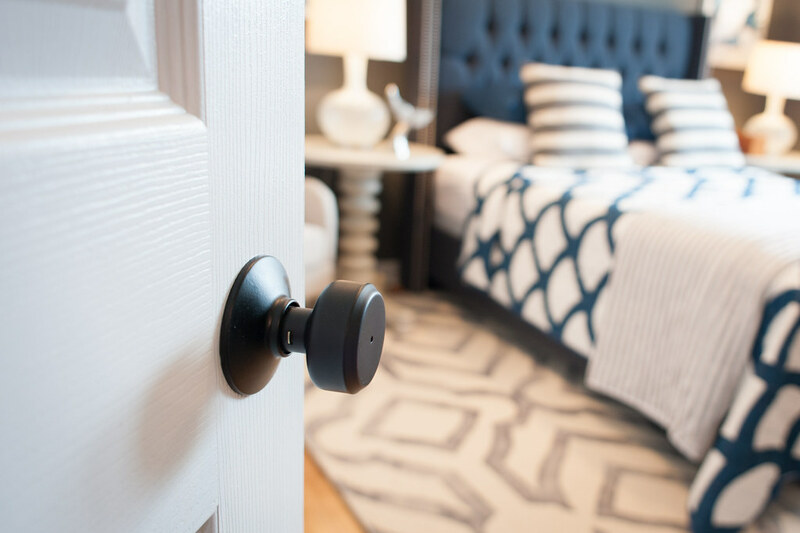 I selected SCHLAGE'S BOWERY KNOB WITH GREYSON TRIM in matte black for the closet, bathroom and bedroom doors. Bravo to Schlage for making a great matte black finish that goes with just about any style. It works as well in a coastal style home like ours as it would in a modern or industrial space. With so little time invested, I finally have matching hardware unifying the apartment and updating the style at the same time. What a difference an hour can make when you have the right materials. I could not be happier with the result! Disclosure: This post was sponsored by Schlage but all opinions expressed are my own.